The new Armored Core: Verdict Day trailer is here, and boy, is it something. Have you ever caught a single episode of an unfamiliar anime halfway through the series and listened to the opening? Something like, "Previously on Super Robot Miniskirt..." and then you're forced listen to random dialog between a dozen different characters jabber on about things you never heard of, all without any context or knowledge of past events while some bizarrely out of place song drones on. That's this trailer. Titled "No Future For Mercs," there's some mention of mercenaries, although I have no idea why they have no future. Maybe they all got pregnant and dropped out of high school. There's plenty of hot and heavy mech on mech action and sweet pose downs to make it tolerable. Check it out. Oh yeah, there's also some line about God and stuff, because if there's one thing a game about massive robots skull-f@#$ging each other with giant nuclear plasma cannons needs, it's Jesus. I played through all of Armored Core V and I can honestly say I have absolutely no clue what anyone is talking about in this trailer. Of course, I tapped out of listening to the story in ACV after the second mission. It's had to become invested in the story when all the exposition is dished out from faceless voices on the radio. 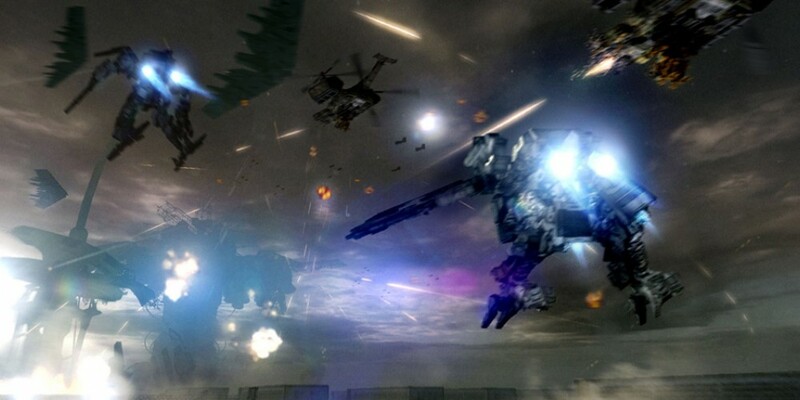 I could never tell if the voices were coming from the armored core pilots or if they were directed at them. Then I shot a bunch of stuff and stopped caring. But hey, the robots look cool and I really enjoyed ACV. As long as I can customize my AC and play with a few friends I'm down for this one. Armored Core: Verdict Day supports two player online co-op throughout the campaign and side missions. It also supports a blend of PvP and co-op for up to five players online in Verdict battles, although there's no real way to predict if you'll be playing against bots or human players in that mode. It should be available on the Xbox 360 and PlayStation 3 this fall. Page created in 1.3658 seconds.